This reference contains detailed information on more than 4000 natural and synthetic trade name and generic chemicals that are used in the flavor and fragrance industry. Flavoring agents are used in the formulation of food, pharmaceuticals, and cosmetics. Fragrances, aroma chemicals, and perfumes are used in these industries as well as other consumer and industrial products in order to mask unpleasant odors. Entries in this reference for both trade names and generic chemicals contain extensive information on identification, synonyms, odor and/or flavor descriptions, molecular formula, chemical properties, function and application, toxicology, precautions, usage level, and regulatory data. Detailed contact information on suppliers of these chemicals/materials is also included. 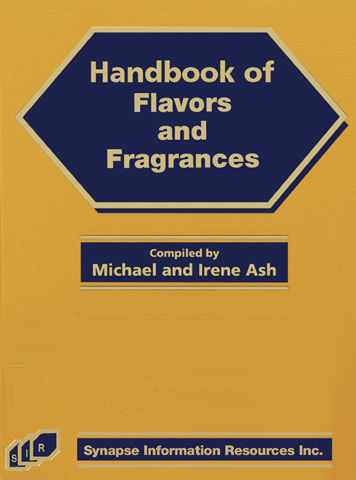 This invaluable research tool will provide easy access to information for all chemical professionals involved in the use of flavors and fragrances in compounding and formulation.